The room was so modern, roomy and clean and the staff so friendly, polite and informative. Where to find Carlisle hotels near an airport? Where can I find hotels in Carlisle that are near tourist attractions? When you're ready to plan your Harrisburg - Hershey trip, you'll find a wide range of first-rate hotel and apartment options in Carlisle. You'll find no less than 25 hotel and apartment options within a 0.1-kilometre (0.06-mile) radius of downtown Carlisle on Expedia's handy accommodation database. Convenience is important when it comes to traveling, so be sure to check out the Carlisle House and Comfort Suites Downtown Carlisle, all of which are within 1 kilometre (0.6 miles) of Carlisle's downtown area. Students, families and the more budget conscious will find some great Carlisle accommodation options that definitely won't blow holes in their wallets. 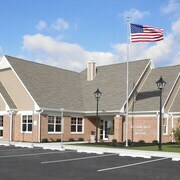 4 kilometres (3 miles) away from Carlisle's center is the Best Western Carlisle. The Hotel Carlisle & Embers Convention Center is only 7 kilometres (4 miles) away. 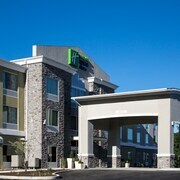 Alternative affordable hotels include the Days Inn Carlisle North and the Days Inn Carlisle South. 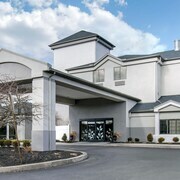 The Residence Inn Marriott Carlisle is located 5 kilometres (3 miles) from the middle of Carlisle. 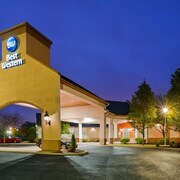 Alternatively, the Homewood Suites by Hilton Harrisburg-West Hershey Area is located 19 kilometres (12 miles) away. 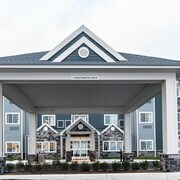 Two other Expedia-listed accommodation options in the Carlisle area are the Hampton Inn Carlisle and the Courtyard by Marriott Harrisburg West/Mechanicsburg. After you have seen Carlisle, set out soak up the many other delights of the Central Pennsylvania area. Admire Central Pennsylvania's rivers and rolling hills. You should also go to a few of its traditional villages and art museums. Fun-loving travelers can enjoy hiking here. 45 kilometres (29 miles) from Carlisle is York, home to the Penn State York and Harley Davidson Factory. 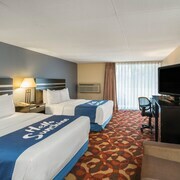 Should you wish to visit York, be sure to check out the Homewood Suites By Hilton York and Country Inn & Suites York. 45 kilometres (29 miles) to the east of Carlisle, is Hershey, home to the Bluegreen Vacations at Hershey, Ascend Resort Collection and Fairfield Inn & Suites Hershey Chocolate Avenue. If you're staying in Hershey, a couple of sights worth adding to your itinerary are the Hershey's Chocolate World and Hershey Theater. Capital City Airport is 30 kilometres (18 miles) from Carlisle. Visitors who wish to stay nearby, you can book a room at the Hilton Harrisburg or Homewood Suites by Hilton Harrisburg East-Hershey Area. What are the most popular Carlisle hotels? Are there hotels in other cities near Carlisle? What other types of accommodations are available in Carlisle? Explore Carlisle with Expedia.ca’s Travel Guides to find the best flights, cars, holiday packages and more!